There’s nothing much lonelier than turning up to a ride and being the only one there! Rippleside Park was pretty quiet. A few joggers did circuits, egged by a personal trainer. There were no cars, and no cyclists. It was cool, partly overcast and the wind was light from the south west – perfect for a post-Christmas ride. After a circuit of the park, there was the reward of another rider. Richard’s Irish drawl, “Is this where the ride starts?” After waiting the mandatory extra five minutes for stragglers (where are you John?) we set off to the overpass for the start of the old Cement Works railway path. This was ultra-quiet, as were the usually busy crossings of Thompson Road, Ballarat Road and Church Street. The drizzle made for a careful descent of Hyland Street. Richard has recently completed a bike tour from Warrnambool to the Grampians and back to Geelong via Skipton, enduring a ride across gravel back roads in searing 35+ heat, so strength was not a problem. The original route was varied to include Merrawarp Road and Cochranes Road, rather than going through Highton. Richard’s Trek road bike has high gearing, but strong legs more than compensated on the climb to Ceres on Barrabool Road. The cruise along Cochranes Road and the old highway cul de sac at Waurn Ponds was a dream. The Baanip Boulevard bike path was new to Richard, and the wind was now assisting the pedals. The eastern section of Boundary Road has become busier, with motorists using this route from the Ring Road and Baanip Boulevard to Barwon Heads Road. Horseshoe Bend Road was quiet, and crossing Barwon Heads Road to South Barwon Reserve easily accomplished. 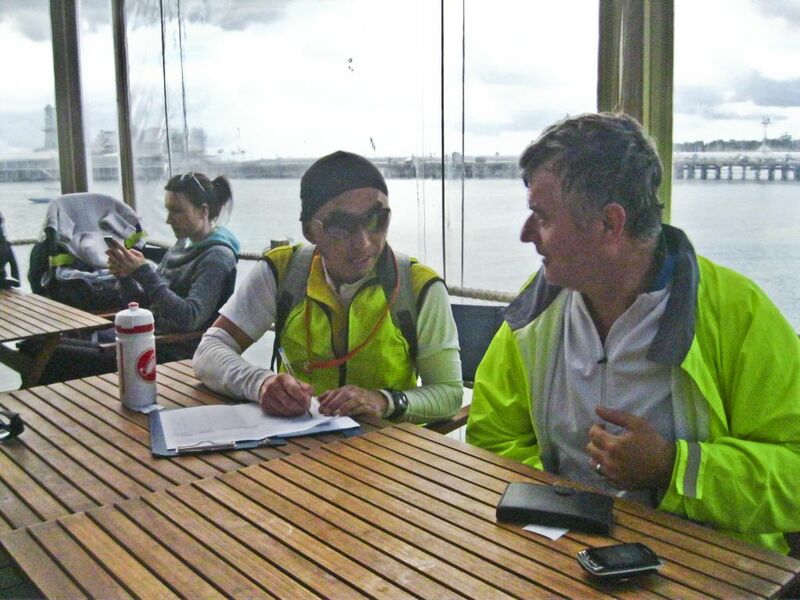 Here Richard met up with the riders from GTC, who’d ridden down towards Barwon Heads with leader John. Our missing President, John M, cruised in whilst we were chatting. He’d had a mechanical incident and missed the start. to go to the waterfront. This best option meant a return to The Boathouse (the venue of last week’s hot coffee stop). There’s good coffee, friendly service, and excellent chips and potato cakes. Today, the upper deck was saturated from early rain, so we enjoyed the covered lower deck. The lower path is a delightful short but bumpy ride back to Rippleside. 51km accomplished, with a couple of hills and good company. Click the map to see the route on MapMyRIDE. Please consider joining us for next week’s joint ride with GTC. Check the Ride Calendar later in the week for the route (planned once we have a better idea of the weather forecast). This entry was posted in Ride reports and tagged Baanip Boulevard bike path, Old Cement Works Rail Trail, The Geelong Boathouse by hlyth2013. Bookmark the permalink.